The Rep’s huge, aircraft hangar of a stage needs some mastering if a play is to work. But these large-scale seasonal plays are served well by the width of the proscenium and it means good effects can be achieved without too much fuss. Bryony Lavery, whose adaptation this is from the Dickens original, directed by Tessa Walker, has kept her possible desire for experimentation to a minimum, added some cheerful music and songs (by Jason Carr) and thus providing the city with a robust and occasionally rollicking morality play which is both funny and thoughtful. There are excellent sets and oddly quaint costumes - Bob Cratchit, for example, is dressed like a dandy instead of in poverty-stricken black and Scrooge flashes his long johns instead of an ankle-length period nightshirt. There are some good performances too but the star of the evening was Jo Servi as Scrooge (replacing Matthew Ashforde who was indisposed). This was one of those moments when theatrical understudy becomes the lead performer - stories that are the stuff of showbiz legend. Servi was completely marvellous, apparently developing the role in a day and a half. As Scrooge he is initially mean and dismissive, terrified when Marley’s ghost clanks in and finally full of human feeling when the final, silent ghost issues a dire warning: live a charitable life or else. The role involves singing and dancing with a need for instant audience rapport. Servi was unfazed and thus turned in the most arresting performance I have seen in many a long day. Please bring him back soon. 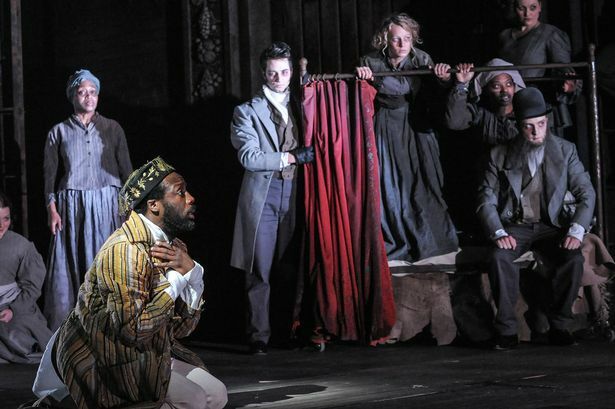 All narrative musicals today are written under the shadow of Stephen Sondheim, and it was no surprise therefore to feel echoes of Sondheim’s Sweeney Todd surfacing from time to time. An enjoyable evening. Dickens had a great story to tell and the Rep lets us hear it.